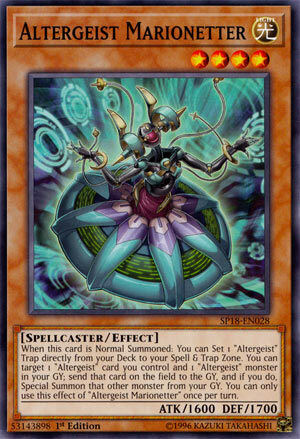 When this card is Normal Summoned: You can Set 1 “Altergeist” Trap directly from your Deck to your Spell & Trap Zone. You can target 1 “Altergeist” card you control and 1 “Altergeist” monster in your GY; send that card on the field to the GY, and if you do, Special Summon that other monster from your GY. You can only use this effect of “Altergeist Marionetter” once per turn. RoTA for an archetype trap off the Normal Summon and set directly to the field. Marionetter can swap out an Altergeist card on the field with an Altergeist monster in the grave, getting you a more useful Altergeist for whatever situation you can come across. In this trap-heavy deck you can afford to lose a trap to get back a monster. Swapping out a Protocol for a Multifaker or Meluseek is a no-brainer to gain advantage. Any monster that can search a card out of the deck is a good card if it fits your archetype. Marionetter in the same turn can get you a replacement trap for the one you pop to get another Altergeist, setting up at least a Link 1 off of this same-turn play. It really isn’t as relevant as it used to be, but I’ve been wanting to do an Altergeist Week and I’m sure Alex would want to as well since he did pick Gouki a few weeks ago, so here we are starting off with Altergeist Marionetter. Marionetter is a Level 4 LIGHT Spellcaster with 1600 ATK and 1700 DEF. Stats are good on a Level 4 but not great, LIGHT and Spellcaster has some good applications, especially Spellcaster in Altergeist since they can use Secret Village. When this card is Normal Summoned, you can set any Altergeist Trap directly from your deck. An immediate Trap is good, the only negative is that Personal Spoofing isn’t an Altergeist Trap by name. You still got access to Protocol, Manifestation, Camouflage, Emulatelf, and the soon to be released Haunted Rock, though only the first two I’d say are staple for Altergeist. You can target 1 Altergeist card you control and an Altergeist monster in your graveyard and send the first target to the graveyard and if you do you can Special Summon the second target. The best things to send probably are Meluseek or Silquitous since Meluseek will search for an Altergeist Monster upon being sent to the graveyard and Silquitous can retrieve an Altergeist Trap from your graveyard. Hexstia can search for any Altergeist card upon being sent to the graveyard, but I don’t think you want to send a Link-2 away for this effect when Meluseek gets your monsters while Marionetter is already getting you to a Trap. You can also send face-up Altergeist Traps if you have two Protocol since you really only need one, but you might want to keep as many as you can in your hand/field cause Silquitous isn’t really enough recovery to just be sending away your Protocols left and right when you really don’t need to. You can revive Multifaker with this, which is your most likely revive target, so Multifaker can summon from the deck but you also got the option to revive a Hexstia since it is a useful Link Monster in the deck. The latter effect of Marionetter is a hard once per turn, which prevents looping, which you’d have to find other cards to make that broken since the search/retrieval cards in Altergeist are hard once per turns for getting cards back. Marionetter gets you to your Traps and can trigger Meluseek when you need and even a Silquitous if you have multiple of those on the field as well as helping get back a Hexstia in the graveyard or a Multifaker, it’s a definite 3 of in Altergeist. Art: 4.5/5 The art of Altergeist are very intriguing. Altergeist week? I’m onboard with that. Austin and I can only cover one theme a week, and sometimes things (like the recent Gouki week) get lost in the shuffle. Altergeist Marionetter is a Light, Spellcaster Monster, with reasonable stats at 1600 and 1700 respectively, and is Level 4. Light and Spellcaster are both good things, and either attack/defense should hold its own for a minute. So a Normal Summon of Marionetter nets (see what I did there) you a Trap from your Deck (of the theme) to be Set face-down on your Magic/Trap zone. A free +1 like that from your Summon (even if it has to be your Normal Summon) is a good thing. Then, by Targeting an Altergeist you control, as well as one in the Graveyard, send the Field target to the Graveyard to Special Summon the Graveyard Target. This is a good cog, a great, essential piece in this Deck, while going about its business in a rather quiet manner. The Altergeist like to swarm, they like to disrupt to a point, and as we see here with this card, they like to cycle as well. They (as you would hope) play very well off each other, and off some Traps of their own (and others) to be a speedy, annoying Deck to play against. Art: 4/5 These are Light Monsters with very Dark vibes and personas, and fairly mechanical looking as well. I do enjoy the contrast of the green and teal, as well as the scattered darkness in the background.